Dust-free, high grade street pad for use in high-powered, heavy cars. Minute adjustments to the manufacturing process and review of the materials used has enable Endless to change the proportions of the materials and the mix to develop the NA-M type, a top-class brake pad for street use. 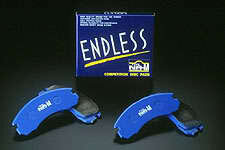 In addition to an excellent initial brake force, the brake pad also has improved brake control performance. This excellent control and safety is best suited to high-powered, heavy sedans.